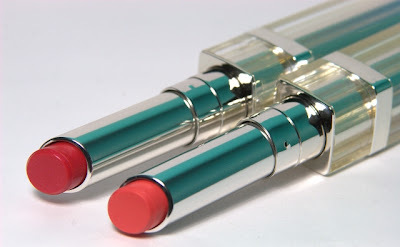 Dior Addict Lipstick - Tango & Couture swatches! The new Dior Addict Lipsticks are here and I was excited to try them and compare them to the ones I already have! I have to say that I find them moister feeling and they have a lot of shine for regular lipsticks. I wouldn't say they were highly pigmented though, even seemingly bright colours like the ones above did not show up as strongly on my lips as I would have expected but since I like a sheer lipstick anyhow (less work to put on) I'm very happy with them! 652 Tango looks pinky coral in the tube but more pink on me - this has quickly become a favourite everyday colour for me! Have you checked out the line yet? What other colours do you think I need? I'd like more coverage but they look pretty on you! I'm in love with the Dior Addict colour Red Carpet since the SA tried it on me at the weekend. I'm planning on purchasing it next weekend and I'm actually quite excited about it (sad, I know). Couture looks fab on you. Lise Watier Like Mother, Like Daughter Contest! Weird TV ad: Kate Moss Likes Bunnies...a Lot! CoverGirl Clean Makeup for Clean Water! Help LUSH lend a helping hand to Japan! La Senza gets your nails and lips Spring-ready! SHAN Swimwear: Get Beach Ready! MAC Quite Cute - but is it quite wearable? Backstage at Toronto LG Fashion Week!